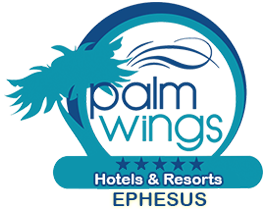 Palm Wings Ephesus Beach Resort SPA Center is at your service to make you feel refreshed while relaxing during your vacation. The Spa Center is the best address for our guests who want to renew their positive energy with carefully decorated massage rooms, rest and purification programs and different options in exotic smell. Relax and refresh your body in therapies where professional therapists practice their touch with fragrant cosmetic brands. You can feel the peace and tranquility by relaxing in sauna, Turkish bath, jacuzzi, relaxation room and hammam. Prepare yourself to meet a different experience in the authentic Turkish bath where you will live the pleasure of bathing and relaxation together. Enjoy the traditional Turkish bath with relaxing massage and scrub applications as much as you like. For a special SPA experience that will spoil yourself, enjoy the pleasure in our Spa Center that is designed with our sauna, steam room bath and relaxation area. Our fitness center is at your service so you can continue your sport at your holiday and protect your form. Our sauna and hammam services are free. Our paid services; SPA, massages, scrub services, beauty care, beauty center need extra payment.